Pair with the Cavallo Gel Pads! Looking for added protection? The Cavallo Pastern Wrap offers an extra layer of protection for your horse’s soft skin when you ride. 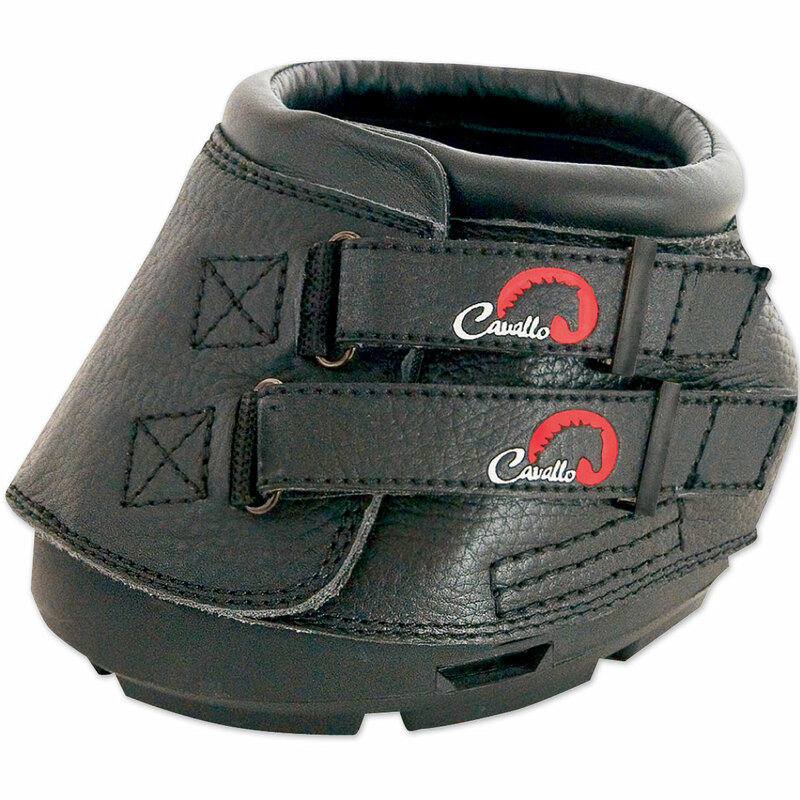 Cavallo Simple Boots is rated 4.6 out of 5 by 101. Rated 5 out of 5 by Christine from These boots are amazing These boots are very sturdy and extremely well made. I have an OTTB with a thin wall on one hoof and cannot hold a shoe to save his life. When that shoe starts to come loose, on goes the boot ... and on it stays! These boots do not slip off like other boots do! Our horses are turned out 18 hours a day, through nearly all sorts of weather and field conditions, and this boot has lasted through downpours hours long, overnight in puddles, inches and inches of mud, large rocks, gravel, even snow. They are roomy enough too that they can hold some cotton gauze, poultice, vetwrap, and ductape during an abscess, so my horses can go outside while their abscesses heal! Another girl at the farm has the same issues with her horse's one foot, so she uses one boot and I use the other, with the same results! Both boots look beat up, but after a wash in warm water, a good dry, and a nice soak in Leather New, they really are in great condition. I cannot say enough good things about these boots. Rated 4 out of 5 by StevenG321 from So far pretty good I have ridden 4 times with these boots and they are pretty good. I have even cantered a few times. They are well made. Do makes some noise while riding. Stay on well. Great for trail riding and tender footed horses. Price could be better, Smartpak had them a bit cheaper than others but still a bit much for me. I would buy again if needed. Rated 5 out of 5 by Janine9499 from Great all-purpose boot! Love this boot! Did a lot of research and this one lives up to its name! So simple and great quality. Good for turn out and good for riding. My boy doesn’t seem to even notice he’s wearing them. Sizing chart is accurate to fit. Rated 4 out of 5 by Sarah from Love these boots! Bought these to transition my horse from shoes to barefoot. I was nervous about using these because I had a hard time getting them on when I first got them in and wasn’t sure that they were the proper size. Definitely recommend getting your farrier to help measure if possible. Otherwise they are great. Takes some time to break them in but so far so good. Rated 5 out of 5 by Mknick from Great boot My horse had abscess and needed to protect foot. He is barefoot on hind so put them on both back feet. They fit well and are easy to put on. He has worn them for week and no problems. They stay on well even when he is running around. Rated 5 out of 5 by Magic63 from Best boot I have used other brands. I trail ride and we do go thru mud and rocks and climb on must trails. I have had to get off and pull boots out of mud duct tape them because the blew apart. I have only done about 50 miles bit I have not lost a boot yet. She seems to love them too. Rated 5 out of 5 by Megd1013 from Love these boots My horse went through a difficult time with his feet and these boots saved him. He ripped off a shoe and took his hoof wall with it. Without being able to put shoes back on he went lame barefoot. These boots allowed him to keep active and move around comfortably. After a few days in them I did wrap his heels in cotton and vet wrap to prevent rubbing. Rated 5 out of 5 by PollyKate from A miracle 27-1/2 yr old Chestnut TB Mare...mine since she slid out...we have lived the good life...we are BOTH paying somewhat for it...arthritis...lameness in both front evident recently, x-rays showed more so in right front...also transitioning to no shoes and pads (after a lifetime) in front...transitioning went well, having trimmed q3wks...but trouble with hard surface/rocks (flat-footed sensitive TB)...ordered these boots and the gel pad inserts...put them on and she walked out of the barn instantly happy! Vet and farrier Happy...I'm HAPPY...MOST IMPORTANTLY, SHE'S HAPPY...we can now start "back to work"...e.g. grassy acres out back...gradually...the gals at SmartPak have spent a lot of time with me on the phone to educate me about boots and arrived at the perfect solution...THANK YOU, THANK YOU, THANK YOU. While the boot was intended to help with barefoot in front transition (no shoes on back for some time now), it has also helped with concussion effect on the arthritis...when I opened the gel packs, they are thin, seem hard...I'm thinking "real gel"...however when you take the boots off, the hoof wall impression is in the thin gel and again, seems to take care of concussion (like shoe pads did) and is forgiving of her flat feet soles...the size 4 (her feet measured 5" wide and 5-1/2" long) are perfect...they do not rub...although I do have a tip if they do...when you order synthetic halter fleece, I don't use the side cheek pieces and tried one in the back of the boot just in case I get a rub and the velcro sticks to the inside and you can then trim off the excess that drapes over the back of the boot...this is a long reply, but to all of us, even the smallest bit of info is sometimes very helpful...happy trails to all! Rated 3 out of 5 by Lauren from Good protection but some fitting problems I bought these boots for my warmblood who is barefoot because of some soundness and infection issues. The boots seeemed to fit fine in the beginning (no problems getting them on) but after a few weeks the boot would rotate on my horse's foot to the point where my horse would act super sore until I fixed it. This would happen every few minutes while I was riding (walking). Also started to notice my horse was getting rubs on his heels from the boot. My horse seemed very comfortable and sound in them at first but once the foot started growing more, the boot no longer fit.